Why are my calls being placed in an invalid route? How can I boost my network signal? Why is my sim card not working? If I lose my phone, how can I track it? Safety note: Do not touch a phone that is wet and plugged into a charger! Remove the device from the water as quickly as possible, and remove the battery immediately. Removing the battery quickly could make the difference to save your phone. Most phones have a white indicator near the battery that will turn pink or red if water has damaged the device. You can try to draw the moisture out by submerging the phone in a bowl of rice or other absorbent material overnight. You can also try to dry it out with a vacuum cleaner, as long as you don’t hold the vacuum too close to the device. Sometimes cleaning the phone with rubbing alcohol will work if it has not been exposed to water very long. Here are some other Do’s and Don’ts. Remove the sim card, memory card, and anything else that might be plugged into the device. Dry gently with an absorbent towel. Don’t push any buttons! This could force water further into the circuits. Don’t use a hairdryer on the phone – this could also push water into the phone and do further damage. Don’t move the phone more than you have to. 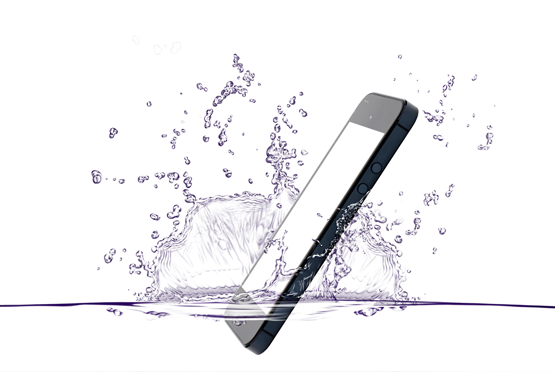 It is best to keep the phone still to prevent water from spreading throughout the device. Don’t turn the phone on too soon. It is best to wait 24 hours before attempting to turn your phone back on. If you have tried the advice above and your phone is still not working, take your phone to a repair center and get it checked by an expert technician.